Home / Blog / What Alternatives Are There To Injection Moulding? What Alternatives Are There To Injection Moulding? 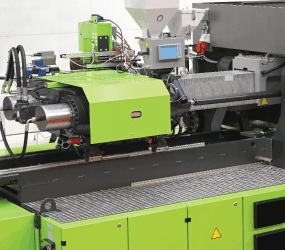 Injection moulding is far from the only option you’ve got when it comes to plastic manufacturing, although it can sometimes get a lot more of the limelight compared to other processes like rotomoulding or blow moulding. Obviously, before you commit to any plastic manufacturing process it’s always best to know all the facts first, and you’re probably already wondering the answer to that common question: which is better, rotational moulding or injection moulding? Well, essentially each have their own advantages and disadvantages, but there roto-moulding is undeniably better suited to producing certain types of products. We’re here to help you get a better idea of what those are! Read on for more details on exactly why! Unless you’re producing them in huge bulk (which can be very expensive – but we’ll get to that later), injection moulding isn’t really suitable for large parts. This is a lot to do with the process involved; first, pre-melted plastic is forced into a tool (mould cavity) within the moulding machine. Then the plastic cools, hardening into the desired part, before it’s extracted from the tool. Now obviously, the tools themselves have to be small enough to fit into the injection moulding machines, which means that there’s immediately a practical limit on the size of plastic products that injection moulding can create. This doesn’t mean large industrial parts are impossible to create with injection moulding, but it usually involves creating several smaller components first, and then piecing them together to form the final product. Not only can this be expensive, but can result in stress points where the components join together, potentially weakening its durability. Meanwhile, with rotomoulding the size limits aren’t nearly as strict. In fact, theoretically there’s almost no limit on the size of products that can be created, and several different products can be moulded at the same time. The cost-per-unit for injection moulding can be quite high when compared to other processes like roto-moulding, which means it’s at its most cost-effective for particularly large batches of products – we’re talking several hundred or more. For anything less, you may well generally find that roto moulding is far more economical. This is because it’s primarily a casting process; no pressure is involved in the procedure and the moulds themselves are inexpensive. All of this means that roto-moulding has a drastically reduced cost-per-unit, so you can make product runs of as small as ten units – or even single products – without having to worry about a disproportionate impact on your finances. Due to the large product runs injection moulding requires, coupled with the relatively lengthy lead times, it’s a plastic production process that doesn’t lend itself particularly well to experimentation. Meanwhile, as you might imagine, roto moulding’s suitability for producing single products also makes it a fantastic vehicle for trialling experimental products or prototypes. It also helps that with roto-moulding, production times are generally much quicker. This means that as long as you’re planning ahead, you can order your prototype and receive it in good time without needing to put too many other aspects of the development on hold while you wait for it to be completed. Plus, the cheaper tools involved in rotomoulding allows you to benefit from greater flexibility on a fixed budget, giving you the freedom to trial different moulds until you perfect the final design of your plastic product. Similarly, if you’re producing a design on behalf of a client or other third party, it gives you greater wiggle room to tailor specific products to suit your client’s requirements (especially if they sometimes move the goalposts, as clients are sometimes known to do!). Again, the inability of injection moulding to efficiently produce hollow parts largely comes down to the nature of the process itself. You don’t necessarily need to know the specifics – all you have to understand is that injection moulding creates products by moving the plastic mixture from the outside in to a mould (hence the ‘injection’ part). On the other hand, rotational moulding works by using centrifugal force to spread the plastic onto the walls of the mould from the inside. For that reason alone, you can’t expect injection moulding to efficiently produce plastic containers and similar hollow products – which automatically discounts many container bins, for example. This makes rotational moulding by far the better option for creating hollow products, and seamless single pieces. By the same token, using injection moulding to make large-scale products often entails using the process to first make several smaller components, then bonding them together to make something bigger. This naturally creates ‘stress points’ at the joins where these pieces bond together, which makes it potentially weaker under pressure. It’s for the same reasons we’ve listed above that the types of products that can be made with injection moulding tend to be, on the whole, relatively simple and uncomplicated. However, with products that need more complex shapes (say, for more specialised functions), roto moulding easily accommodates production complexities like moulded inserts or extra stiffening ribs. Different surface textures are similarly possible to increase grip or friction on the final product – helpful for products like safety steps. We’ve touched upon how the roto-moulding process works – you can find more information on our roto moulding page if you want the full details. The centrifugal force involved is instrumental in achieving consistent wall thickness throughout the product, with the corners tending to be thicker where the plastic powder piles up inside the mould. Not every other plastic manufacturing process effectively manages this, and it results in products that are automatically hardy and durable. Whatever the application you have planned for your own plastic product – and whether or not it specifically requires uniform wall thicknesses – increased durability is always an excellent bonus for getting your money’s worth from a product! Roto-moulding is something of a specialism of ours here at Excelsior, and we’ve got decades of history behind us in delivering quality plastic products for our customers, including bespoke products using our contract moulding process. You can click here to see our successful case studies for previous customers, or give us a call on 0161 765 2010. We’re here to help!